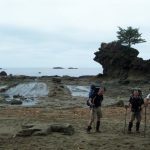 The West Coast Trail is without rival, the most beautiful hiking in Canada, possibly the world. 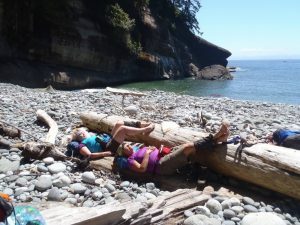 Seventy-five kilometres of gorgeous scenery, sometimes brutally difficult trail conditions and white sand beaches to recuperate on every evening. 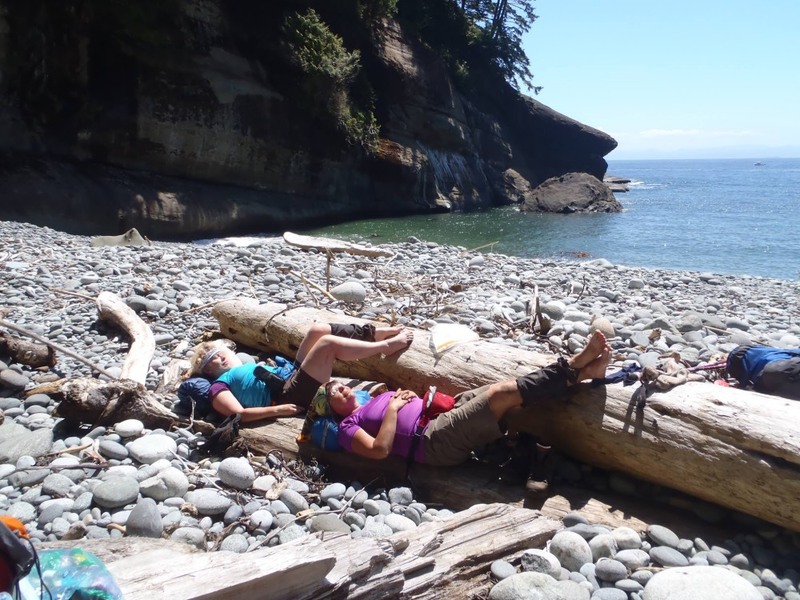 The trail runs along the west coast of Vancouver Island, from Port Renfrew in the south to Bamfield in the north. 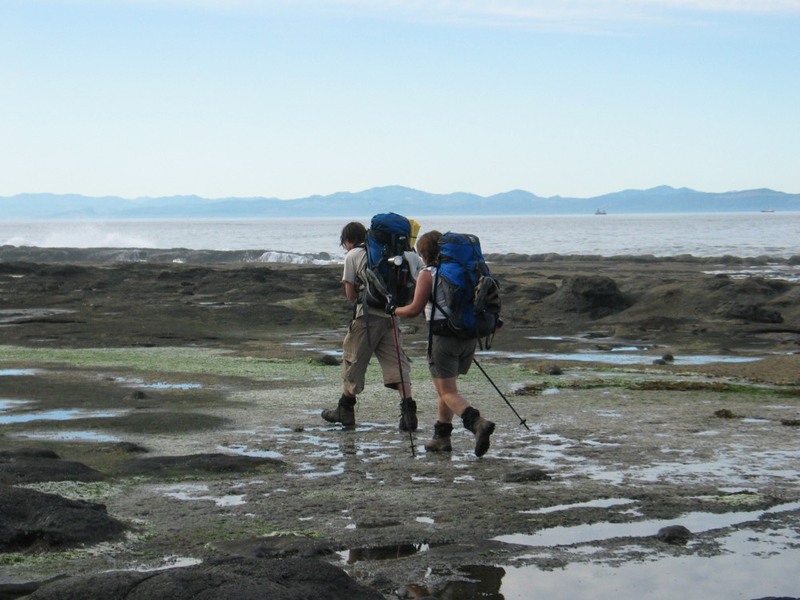 It is rugged wilderness, inaccessible to anyone but committed backpackers, and yet registration is required and tricky because of all the interest. My connection to this trail goes back a ways. This is the last major trip my Mother hiked before passing away. She came home with remarkable stories of her 6 days on this trail. 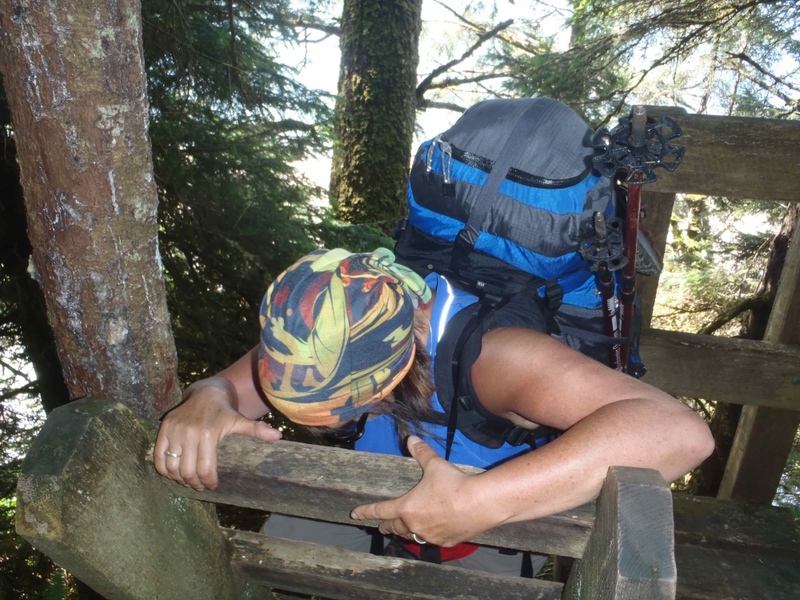 When she passed, we three children decided to scatter her ashes on her three favourite trails. 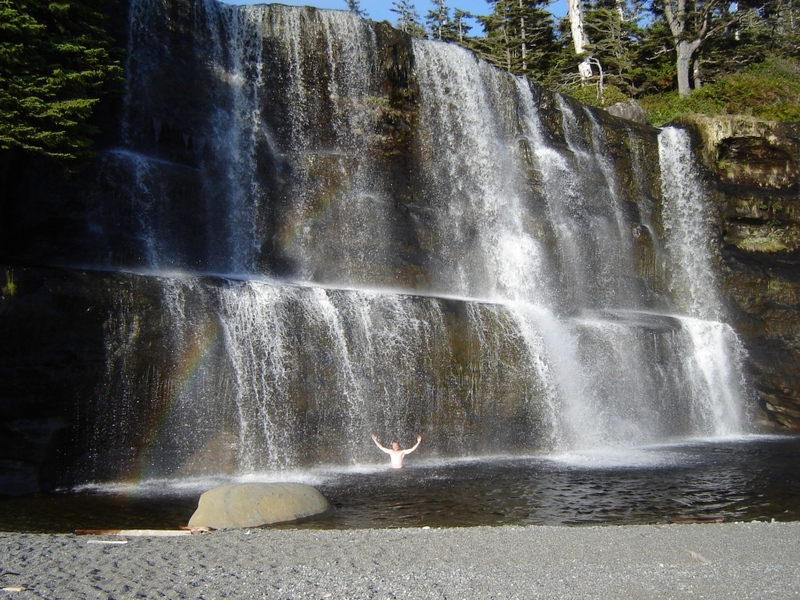 My brother picked the West Coast Trail, and one day kayaked out to Tsusiat Falls alone with his share. From that day, I’d started planning my West Coast Trail hike. My sister tried the trail out once, but injured her ankle so did not complete it. 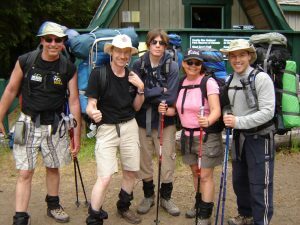 This account covers three hikes over the years 2005 to 2013. No matter which side of the trail you start at, its a one-way walk. 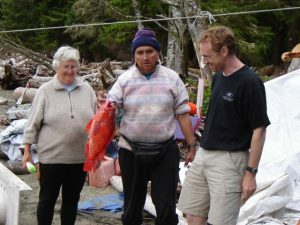 In 2005, Pete and I rented a car at the Nanaimo airport and drove to Bamfield. It’s an interesting drive over many miles of logging roads. 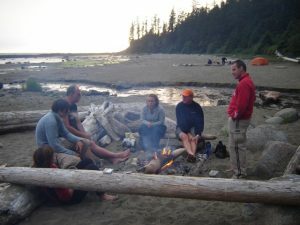 Bamfield feels incredibly remote, but you will want to make a reservation at the Pachina Bay campground as its way more popular than you would expect. 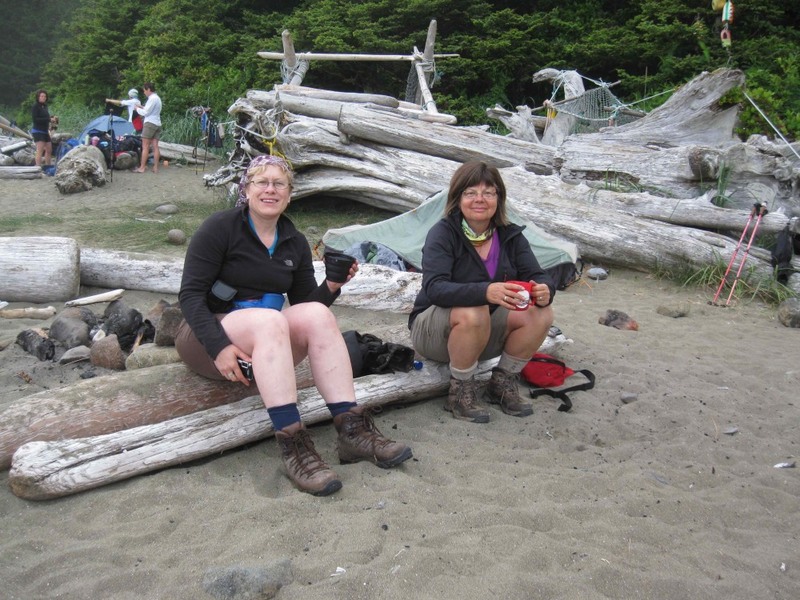 We left our car at the Bamfield trail head, planning to take the West Coast Trail Express bus back from Port Renfrew. In 2006 we hiked the trail with friends. One group – Glen and Chris – flew into Victoria and rented a car while we flew into Nanaimo and rented another one. We picked up Glen and Chris in Port Renfrew and crammed 5 people and 5 backpacks into a compact car and then drove 3 1/2 hours over logging roads to Bamfield. When we finished in Port Renfrew, Glen and Chris had their car waiting, while we took a water taxi back to Bamfield. This proved to be the most expensive and uncomfortable way to handle the transport and I definitely don’t recommend it, but the water taxi was a great excursion. When I came back with girlfriend Christine in 2013, things had changed quite a bit and we had a built-in taxi service in my son Rob who now lives in Victoria. 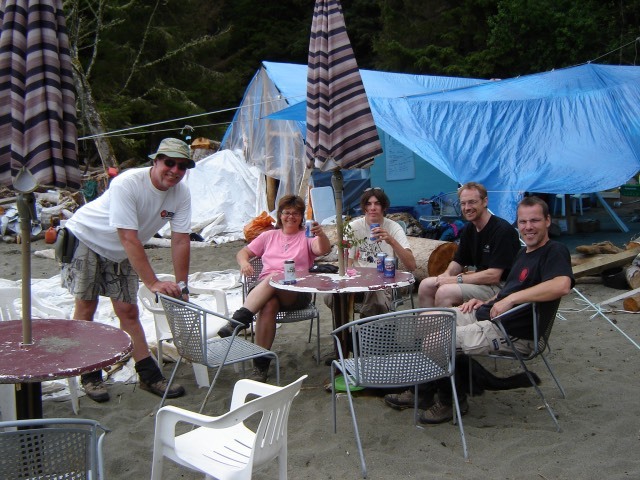 He drove us to Bamfield and camped with us at Pachina Bay, then picked us up six days later in Port Renfrew. Having friends or family drive you is by far the best and easiest way to get around. 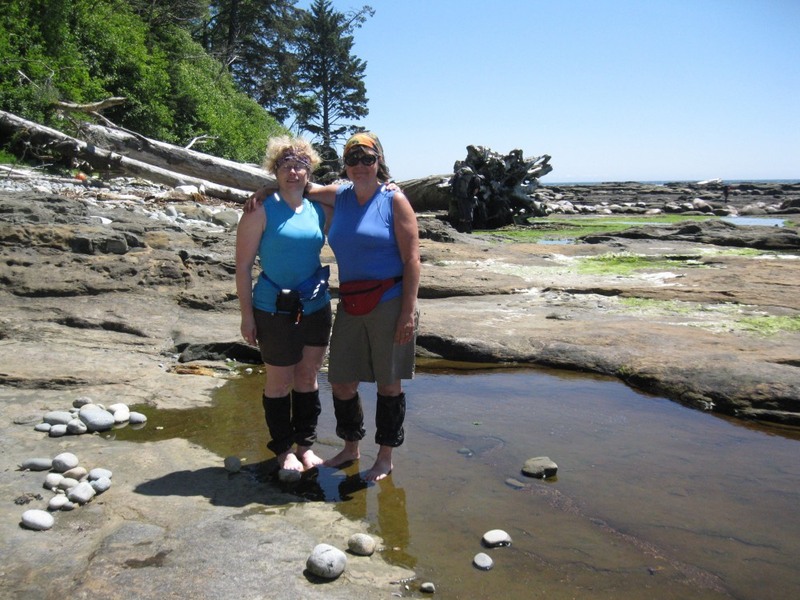 In 2005 I had a 15 year old son in need of adjustment and the memory of a mother/daughter hike I did some 40 years earlier. 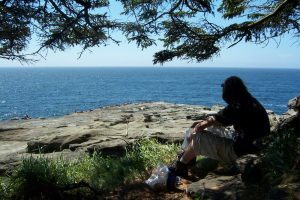 When I suggested a hike to Pete, he seemed less than enthusiastic – until I mentioned that maybe it could be the West Coast Trail. The magnitude of this particular journey intrigued even him, and he willingly came on board. He was actually technically too young to register, so we had to lie about his age. Pete and I did not complete the trail in 2005. Back then we were warned, at the orientation session that all hikers must attend before heading out, that only life threatening injuries would warrant an official rescue. We carried cash, because if anything went wrong we knew we’d be looking to the local native people – or trail guardians as they were known then, for help, and rescuing hikers was their livelihood. We also smirked at another warning, of dangerous cougar attacks. There were always these mysterious cougar sightings in Pinawa that no one took seriously. 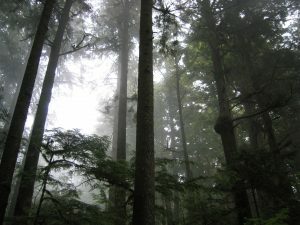 While we were out on the trail ignoring the warning, a young boy was mauled almost to death just a few kilometres away. Day one with Pete was pretty great. We were greeted with some of the tallest ladders of the entire trail within the first hour, and I was completely terrified. Pete climbed them twice so I could climb without my backpack. He was looking after me. Our campsite at Michigan Creek was beautiful and we spent a quiet evening around the campfire together. We figured out we have brought way too much food. Our second day of hiking was a little more of a test, and by the time we arrived at Tsusiat Falls, Pete has had enough. He informed me that if it started raining he was done. Done, I wondered? What does that mean in the middle of the wilderness? We set up camp in a cave and spent the evening trying to “glue” a commemorative plaque we’d had made that was to honour my Mother, Pete’s Grandmother that he’d never met. We also fed half of our food, including at least a kilogram of chocolate (what were we thinking?) to the crows and the fishes, lightening our loads significantly. I tried but failed to convince Pete to come for a wash and a swim in the falls with me, he was too tired. By Day 3 Pete had met a friend and we separated on the trail. It wasn’t until the next year that I would find out where he actually twisted his ankle, but today Pete got injured and we were stopped – in the very middle of the WCT. We’d made it past the Nitinat River crossing, but not to the Cheewhat River, so we were forced to camp in a location without fresh water. Of all the luck, I met a park warden on the trail, but when I explained our situation he was clear – there was no rescue possible if the injury was not life threatening. That night was difficult for both of us. Pete climbed into his tent in pain and refused to come out or even let me examine him. I was alone on the WCT wondering what to do. I found a muddy puddle and pumped water until my arm was ready to fall off, but got enough to drink and make dinner. I’d brought a little vodka, this seemed the appropriate time for it. The next morning dawned warm and sunny and it was truly a new day. 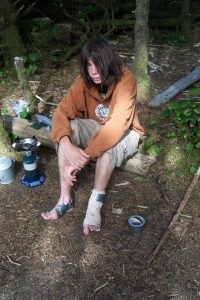 We assessed Pete’s ankle, a nurse hiked by and determined that if it wasn’t broken it was at least very badly sprained. His feet were covered in blisters that he’d done nothing about, a rookie mistake for sure. We still had a LOT of food, and the muddy puddle could still produce fresh water. We laid ourselves out on the white sandy beach and decided that, at least for today, we would just enjoy the sun. 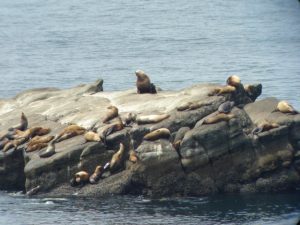 At one point the warden’s boat drove by, and we idly wondered if maybe he was looking for us, reconsidering a rescue. 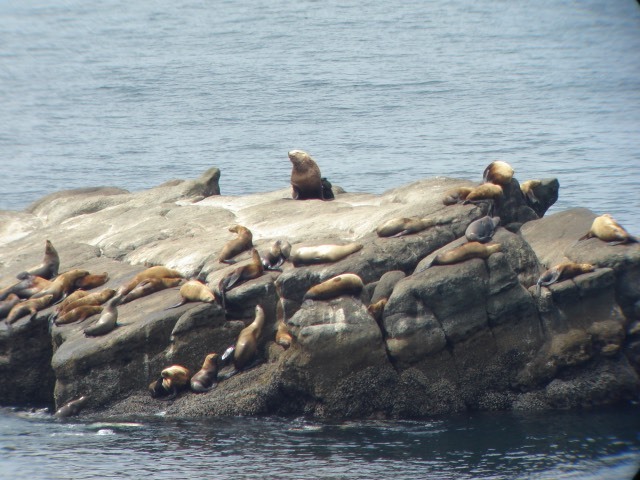 We did not get up to wave. Mid-morning a native man walked down the beach and stopped to chat. “Is everything okay?” We explained our situation and he said he had a boat just a few hundred metres down the beach that he was waiting for the tide to float. If we could get there he would give us a ride to the Nitinat River. From there we would be able to get a boat into the Nitinat reserve with the fellows that ran the ferry crossing. We quickly packed up (leaving a tent pole behind in the sand) and limped slowly down the beach. We met an entire extended family who had been out camping for a few days, and it was this boat we got a ride with. It was fantastic. At one point 2 little boys took a smaller boat out and went chasing some whales – they got heck from their parents when they came back. “How many times have we told you not to chase the whales?” A different way of life. When we got to the Nitinat River we had to wait all afternoon until there were no more hikers to use the ferry service. We visited with people all day, everyone very interested in our self-rescue adventure. Nitinat Reserve was a colourful place, literally, as the fresh-water tidal river is an excellent place for kite surfing, and this day the sky was full of them as we pulled in on our boat. The campground was so full of weekend kite-surfers we were unable to find a spot for our tent, and had to set up behind a closed motel instead. Luckily there was a bathroom / shower room that was unlocked for us. 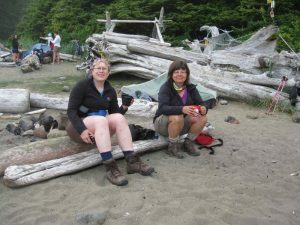 We called the West Coast Trail express bus, but it wouldn’t come into the reserve unless there were 3 of us – how rulesy is that? 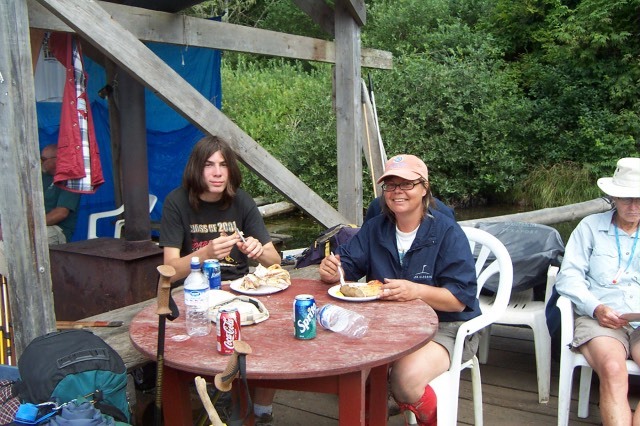 The next morning, Monday morning of a long weekend, we set out to hitchhike to the bus stop. Not a single “camper” would stop for us, with their 4X4’s and huge RV’s, but a native with a rusty old truck did, and Pete and our packs rode in the back. When we finally made it to the junction where the bus would eventually come, it didn’t see us and drove right by. With a once a day schedule, we were devastated, until we heard it backing up. A passenger had seen us waving and heard us yelling. We were rescued. It was quite the adventure. We resolved to go back and do the trail someday, but who knew we’d get the chance the very next summer. This year we’ve brought 2 friends along, Glen and Chris and Ray is along as well. We set out from Winnipeg on July 1. The trail has changed little from last year. One big difference is with Pete and I. The WCT can be a surprise – how difficult the terrain is, how much a heavy backpack makes a difference and how high the ladders really are. It’s easier when you know what to expect. Everyone is again exhausted by day 2, Tsusiat Falls but at least I know I’ll recover. Ray is wondering what he’s got himself into. Day 3 one must watch the tide and leave camp accordingly to get through the “hole-in-the-wall” at low tide. We dawdled too much and had to jump over rocks to get through. Pete’s boots got wet and he stopped and dried them with a candle right there. He was not planning a repeat of last year. We didn’t hike with him much more on that trip. He was nicknamed the gazelle, no one could keep up with him. What took us 7 days he could probably have done in 4. We had an amazing hike this time around. 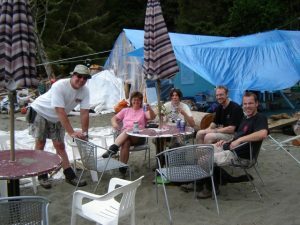 We had a long stop at Chez Monique’s, a blue-tarped “restaurant” on the beach near Carmanah where Monique and Pete serve fish burgers made from the days catch and ice-cold beer. We were planning to camp just down the beach so we enjoyed several of those bevvies and Glen even had a second fish burger. Like last year, the weather for us held out beautifully. We enjoyed seven days of sunshine, unusual for this region. The trail itself was even relatively dry. 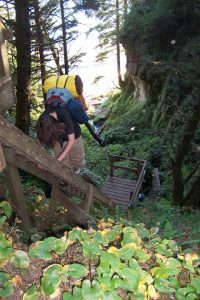 As you hike south, the trail gets increasingly difficult. 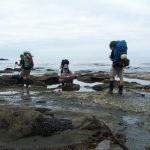 One day we found ourselves crossing around Owen’s Point, climbing up and down huge boulders while the Pacific Ocean tide rushed in, threatening to strand us there. We made it just in time. One of the things we carried on this trip was booze, enough booze for several drinks around the campfire. I carried my own little bottle that I carefully rationed. On the last night, when I pulled out that butterscotch liqueur that everyone had scoffed at 7 days ago, I was a hero. Here I go again! This time, I’m hiking the trail with my dear girlfriend Chris Spinney and it’s a different kind of trip all together. Chris lives in Vernon so there’s not much opportunity for training together. She hiked her trails and I hiked mine, but once I came her way and once she came mine. The trip was a whole year in the planning. There’s something empowering about backpacking without the power of a man. There would be no booze on this trip, and we were to sleep in the tiniest (lightest) tent two people could fit into. Can you say cozy? 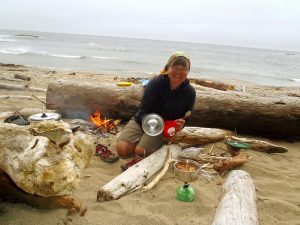 For a month before we left we compared the gourmet meals we were preparing with our dehydrators. We decided to take turns making dinner. We were so careful with the food and yet we had enough extra to help out a family who had lost all of theirs to the crows. We had vehicle support this time around. My son Rob drove us out to Bamfield and camped with us, and then picked us up 6 days later in Port Renfrew. If you ever want to hike this trail without rain, just come with me. We started the trail in knee-deep mud as a week-long deluge has just ended, but we saw not a drop of rain. 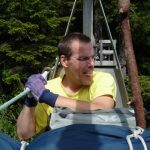 Chris was an absolute pleasure to hike with – fit, strong and in the right head space for this kind of adventure. There’s a day on the trail where things start to get stupid hard – where the pace slows down to a kilometre an hour. Chris did have a little crash here, and I worried about the next 3 days – which I knew were just more of the same. After a good nights sleep in our very cozy abode, though, Chris woke up raring to go. From that point on it was “bring it on” – the tougher the better. We both had a fit of laughter while dangling from a huge ladder whose rungs were missing in dangerous spots, a ladder we didn’t even need to take but did just to find a nice camp spot with some friends. Speaking of friends, we met some great ones. 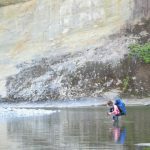 Yujie from California was a tiny oriental girl hiking alone, with almost no food and the tiniest of backpacks. We also met the Starratts, an entire family hiking the trail together. They had matching buffs. The trail has changed significantly from 2006, and not in a good way. I knew there had been a big storm a few years back that had damaged some of the trail, but I was really disappointed in its current condition. For some reason, the local native trail guardians are no longer in charge of trail maintenance. Back in 2005 and 2006, you would come across the odd trail guardian, with a backpack full of wood and a hammer. 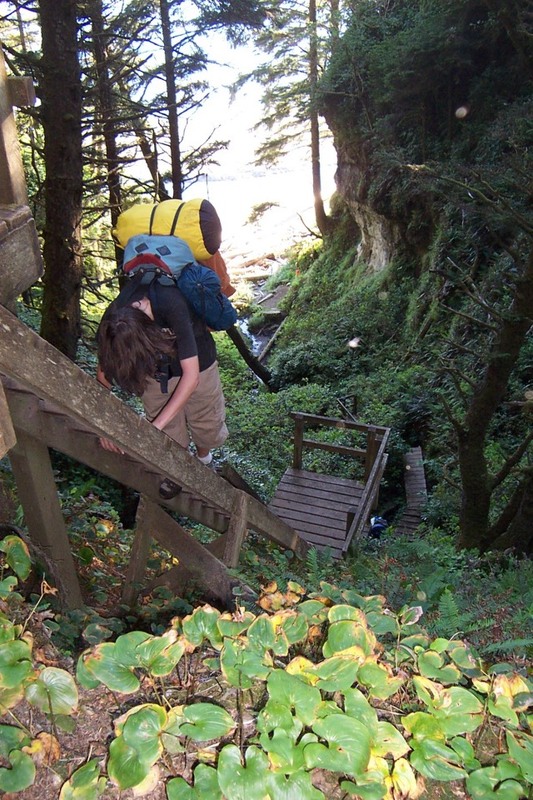 Their job was to hike the trail and keep the many ladders and miles and miles of boardwalk in good repair. The government has taken over that job now. Once in six days we came across an entire group working on a ladder. We could hear them from a long ways away, hear the chain saws, the generators and the music blasting. Instead of replacing a few loose rungs they were building an entire new ladder, and were commuting by helicopter to do it. This was so much more invasive. To make matters much worse, the other ladders and boardwalks have fallen into sometimes dangerous disrepair. We witnessed one man walking through a swamp on a boardwalk when the rotten boards broke under his foot. He twisted his ankle and then fell right into the muddy mess. We ourselves climbed many ladders with missing rungs. It may be that storm that did all that damage, but my impression was that the new system is not working as well as the trail guardians. Another really major difference this year is the rescue system. Where before you had to be dying to get rescued, now you merely needed to put up your hand. There are several “rescue zones” along the trail. Your admission fee now includes the cost of a rescue. Maybe that’s an improvement, but I can’t help thinking of the adventure Pete and I enjoyed in 2005. There are now cabins you can rent on the trail. You can’t yet stay in a cabin every night, but this is what the local natives seem to have traded trail guardianship for. There’s a helicopter landing pad at the cabins. If you’ve had enough by then, just hail a ride I guess. Nothing stays the same. If you want to hike the trail, here’s a few things you need to know. You do need to register ahead of time here. Check ahead of time to see when reservations open. I’ve always hiked in July or August, the driest months on the trail. Get yourself a copy of the latest edition of Blisters and Bliss – the WCT trail guidebook. This is not a trail for sandals – wear sturdy boots and baby your feet to prevent blisters. Traveling from north to south is by far the easiest direction. Some people like to get the worst over with early but in truth you get harder, stronger and lighter out there as you go. Do not forget your camera. This is one of the most scenic hikes you’re ever going to take. The trail is more about frame of mind than fitness. Enjoy!